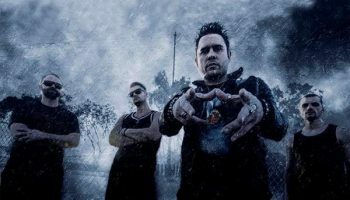 Interview: Chris Taylor Brown of Trapt – Spotlight Report "The Best Entertainment Website in Oz"
Recently I had a chat with Chris Taylor Brown, front man of American Rock band Trapt. We had a brief conversation about their upcoming Australian tour, their new music that is set to come out in June of this year, and what he band has been up to. SR. You guys are coming to Australia very soon, at The Enigma Bar in my home town, how are you feeling about that? We’re very excited. We haven’t played at that venue before either, so I’m sure that’ll be great. We’ve played in Adelaide before though, and it was awesome. SR. Your last record came out in 2016, are you guys working on any new music? Yeah, that was a great record! We’ve got a new one coming out in June this year, and we’re very excited about the new music we’ve created. SR. Will you be giving us a taste of those new tracks when you come to Australia? Yeah, we will be throwing a couple in the set list. As well as some classics, Head Strong of course. SR. What’s your favourite track of yours, out of your entire discography? I love them all man, I couldn’t pick one of my babies. I know our Australian fans are awesome and they love everything we play, so it’ll be an epic show for sure. We’re gonna give our all with every track we play, and hope that everyone has a great time. SR. Do you know anything about the support acts for your Australian shows? Nah man, unfortunately not. We don’t pick them, we only find out just before we play. I have faith that they’ll be awesome though, they always are in Australia. 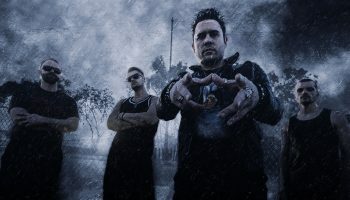 SR. Aside from the new album coming out, what’s next for Trapt? We’re doing a bunch of touring this year, and when the album comes out it’s all gonna be promo, promo, promo! And then lot’s more touring, it’s really exciting. SR. Are you going to be doing any sightseeing or anything between your Australian shows? Yeah, I’m keen to do as much sightseeing as time allows in every city I’m in. It can be a tight schedule, so we sort of have to go with the flow and as soon as we have spare time, we’ll be out exploring. SR. What kind of music did you grow up listening to, and how has that influenced you as a musician? As a kid I loved Rock n Roll and grunge music, and that’s inspired my whole career as I’ve gotten older. I love anything old school and punchy. Honestly, I think it would be Post Malone. He seems like a cool dude, I think we could make something awesome happen. SR. Have you got a favourite song overall to perform live? I think it’d have to be Headstrong, everyone loves that one, and everyone gets into it. It creates such a special energy, it’s an amazing feeling. SR. How did you come up with the band name ‘Trapt’? We were sixteen year olds in high school. We were young and rebellious and we felt trapped by society, so that’s what we came up with. We wanted to be strong and above the things that try to trap us. SR. What are some of the main messages you try to convey through your lyrics? We just write what we feel, and we hope people connect. Everybody interprets music in their own way, so however people receive what we write, we don’t care, as long as they’re enjoying and connecting with it. SR. Have you got any fond memories from the last time you were in Australia? I remember it was a really cool crowd and we had an awesome time at every show. Australia is one of our favourite places to tour, you guys get crazy at shows. SR. What’s the craziest thing that’s ever happened at a show or on tour? Well, one time we had somebody come on stage, and they were a bigger person. They wanted to jump off the stage and crowd surf, and they did, and the crowd just kind of parted beneath them and they jumped straight onto the floor. That was kinda funny and crazy. SR. Have you got any messages for your Australian fans? Be ready for a high energy show and an awesome night. We’re gonna bring our all, and we want you all to sing along! 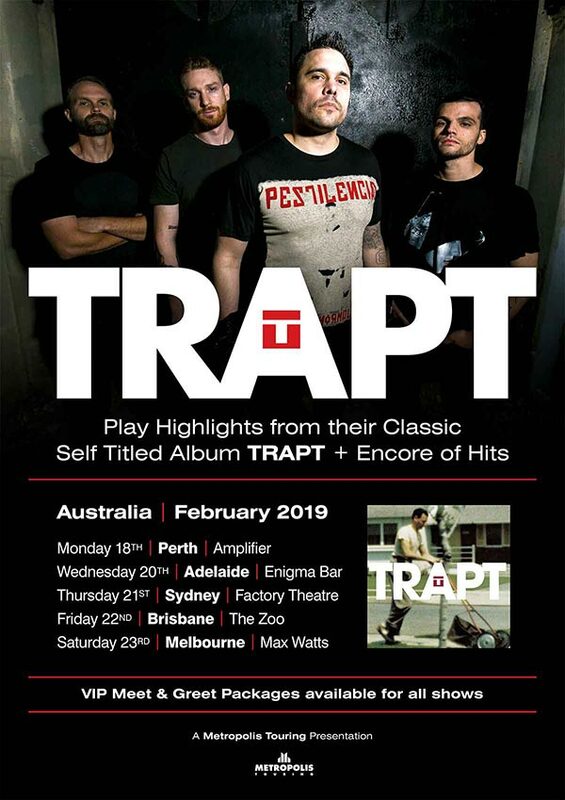 You can see Trapt play live in all major cities across Australia, and you can check out their music on Spotify or iTunes. To keep up to date with them, follow them on social media or via their website. 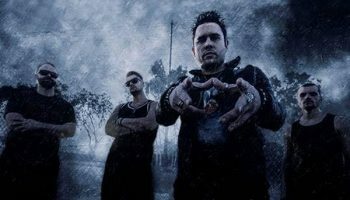 TRAPT Announce First Ever Australian Tour!